The Export nodes allow you to export the results of your work. You can export a terrain or a mask in several file formats, and a mesh as an .fbx file. 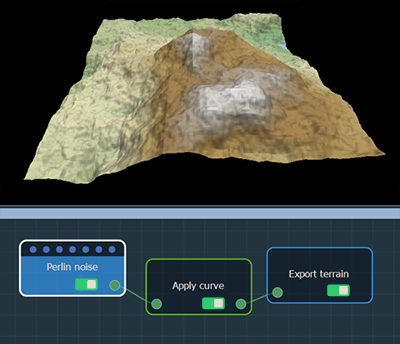 Export terrain: This node export a terrain as a gray scale image file. Multi file (tiled) export terrain: This node export a terrain as several gray scale image files. Export mesh: This node exports a terrain in the form of a mesh as an .fbx file. Export mask: This node exports a mask in the form of a gray scale image file. Multi file (tiled) export mask: This node export a mask as several gray scale image files. Export color map: This node exports a color map in the form of a mesh as a tiff, png, tga, or bmp file. Export normal map: This node is used to export and view a normal map computed from a terrain or a composition as a tiff, png, tga, or bmp file.